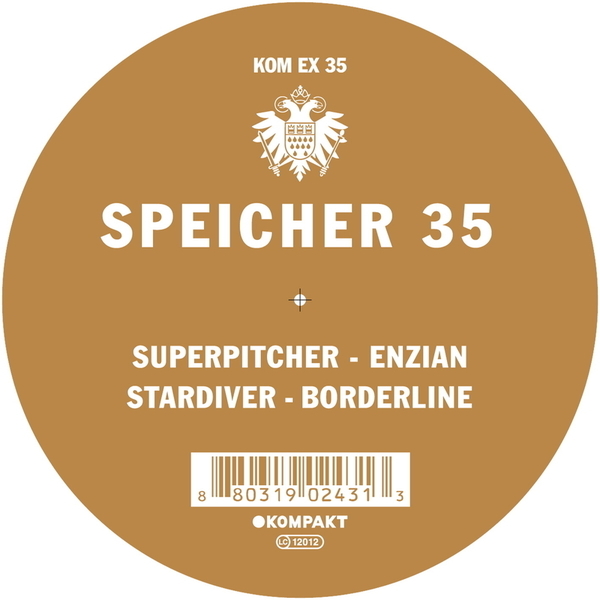 Super special acid time for speicher 35, with Superpitcher doing big room techno business on top, his first new tune in what seems like ages and supergroup Stardriver taking care of business on the flip. You might well be interested to know that Stardiver boasts as members Bolz Bolz, Jörg Burger and Wolfgang Voigt. Blimey o'riley. Superpitcher really does something incredible with a upward-soaring, pure acid groove that just keeps on pushing, tension derives from the delicate chording, and you certainly notice there's a piquant strain of ital-disco permeating these producers these days. You might consider Superpitcher in the same breath as his label-mate Justus Kohncke, absorbing over thirty years of disco history, and still emerging with something fresh to say. Stardiver opens with a dippy deep bass workout slightly more gentle in comparison to superpitcher's offering, hints of quality retro trance feelings run deep in its veins. Past the midpoint the "Borderline" track increases the tempo and the bleeps per €uro increase appreciably too - the tonsured fringes will dig it for sure. All in all this comes packed well solid, another kompakt speicher record made for your boxes or designer satchels.